The students first gathered on Boston Common before crossing Beacon Street to the State House and then marching past City Hall to Faneuil Hall Marketplace, where they used bullhorns to decry anticipated program cuts and the expected loss of teaching positions. A handful of scuffles broke out in crowded Downtown Crossing after the rally Monday afternoon, as protesters gathered alongside a large group of Boston police who ordered them to disperse. No arrests were reported, however, and for the most part the protests were peaceful. Some students at the rally criticized Mayor Martin J. Walsh for not providing more schools funding. Walsh defended the district budget process in a phone interview Monday afternoon, saying it was still in flux and that an early estimate that the deficit could be as high as $50 million was overstated. He said the actual shortfall is closer to $30 million. Next year’s record schools budget, which will top $1 billion for the second year in a row, includes a $13.5 million increase over the current budget, but that bump is not enough to keep up with increasing costs, city officials have said. Walsh said the School Department must look closely at expenses in the central office, school administrations, transportation, and food services to find savings it can pass along to classrooms. Some adults, he said, “have given false information to students,” and he questioned whether outside groups had influenced the protest. The walkout was promoted by the Boston Youth Organizing Project and the Boston Education Justice Alliance. 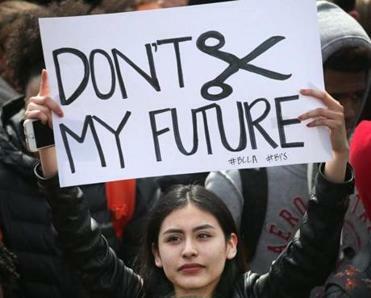 A national group, the Alliance to Reclaim Our Schools, has said the Boston protest was part of a nationwide series of actions fighting cuts to local school district budgets. Some activists involved in the protest are also involved in the effort to prevent a lift of the cap on Massachusetts charter schools. Students who left class Monday were marked absent, and their parents were notified, but the district did not direct principals to discipline students, a School Department spokesman said. As the students marched past City Hall, Michael D. O’Neill, chairman of the Boston School Committee, watched from Cambridge Street, where he said he had spoken to several students as they passed. O’Neill said that while he never would encourage students to miss school, he respected the protesters’ activism. As altercations broke out in Downtown Crossing during the afternoon, Michael Curry, president of the Boston branch of the NAACP, waded into the crowd and called for calm. He said minor scuffles among a few of the hundreds of students who protested should not distract from the larger issue. “This is about, really, one of the largest demonstrations of young people that the city’s ever seen,” he said. Reggie Dennis, 19, a student organizer from Boston Day and Evening Academy, estimated that about 2,500 students participated in separate protests downtown, at schools around the city, and at the School Department headquarters in Roxbury. “Seeing all these people who actually did come out, in the short time that it was put together, was really surprising, and it was really empowering,” Dennis said. The walkout began around 11:30 a.m. as students filed out of schools. Outside Boston Latin Academy, students gathered at Quincy and Warren streets and packed MBTA buses headed toward downtown. Sophomore Chrisleen Herard of Dorchester said the students were worried they would lose elective courses and some of the school’s foreign-language offerings. The cancellation of some foreign language courses would mean that more students would pack the remaining language options, she said. Sophomore Jessica Gomez, who travels from East Boston to Latin Academy each day, said she was concerned that she might lose a free student MBTA pass, and have to spend $75 per month. “We need it to get to school, and we shouldn’t have to pay for transportation,” said Gomez, 16. Advocates for Boston’s public schools also protested the proposed cuts at a School Committee budget hearing Monday night at English High School. Superintendent Tommy Chang proposed in January to help close the shortfall by making cuts of $20 million from the central office budget and $10 million to $12 million from the per-student funding formula, which affects the budgets of individual schools. The School Committee is set to approve a new budget by March 23. Aimee Ortiz and Travis Andersen of the Globe staff contributed to this report. Jeremy C. Fox can be reached at jeremy.fox@globe.com. Follow him on Twitter @jeremycfox.